Last Saturday I went to a local golf tournament with my friend Jonathon. I knew he is a golf enthusiast. So I thought it would be fun to have a golfing session with him. However, the game turned out to be a tricky time for him. Despite his interest in golf, Jonathon had a hard time to aim for the targets. During the drinks, I told him about the TecTecTec ULT-X Golf Rangefinder. Do you want to turn your golfing sessions exciting with at least a few "Eagles" and "Birdie”? Then, this rangefinder will be your best friend. This device will help you to aim the farthest target in any golf course. I can lock flags at up to 450-yards. Moreover, I can detect any background hazards like sands, trees, etc. at up to 1000-yards. Latest Target Locking (TLT) and PinSensor laser technology are the unique features of this champion rangefinder. Pinpoint accuracy is our requirement from any rangefinder. This ultimate range finder will give you a chance to see that. You will get ± 0.3-yard accuracy at 300-yards. The VPRO500 and VPR500s models of TecTecTec rangefinders provide ± 1-yard accuracy in the same length. When the course is not flat, you can use the slope feature of this rangefinder. Moreover, it will vibrate when you lock at your target. Scan mode uses PinSensor technology and gives you an instant overview of the entire filed. You will be ready for all situations with the TecTecTec ULT-X Golf Rangefinder. The device itself is rainproof and moisture resistant. Moreover, you will get a free case and a CR2 battery with a lifetime customer support. This super affordable rangefinder comes with a two-year warranty and a 100-days money back guarantee. Why will you pick ULT-X over other golf rangefinders? The first best thing about the ULT-X rangefinder is the Target Locking Technology. It helps to detect any target. It will focus on your desired target no matter what kind of background the golf course has. The second best thing about the ULT-X is the PinSensor laser technology. The laser measures distance avoiding any interfering objects within your view. Reflections form raindrops will not create any problem to locate the flag of the next hole. What kinds of target mode ULT-X have? 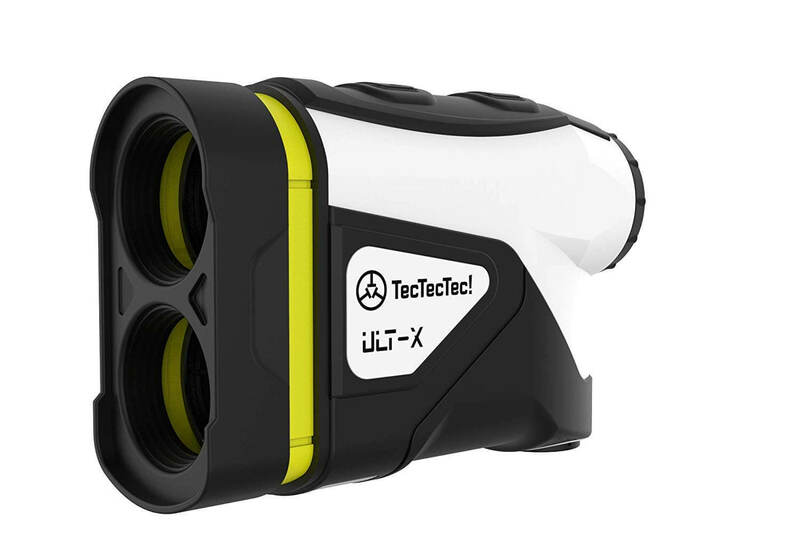 The TecTecTec ULT-X Golf Rangefinder has both Target Priority and Normal Mode. Target Priority Mode measures the distance of the closest subject from any background. But it is not a problem if the flag is in front of the wooded backdrop. Target Locking Technology will pick the flag for your next hole. Normal Mode measures the distances of the hazards around your target. You have to switch to Normal Mode when you deal with the sands, bushes, or other natural obstacles. What is the use of Scan Mode in ULT-X? The Scan Mode in ULT-X uses the ProScan technology. It is like an overview of the entire fields with accurate distances of the objects. When you pan over the field, every object in the field of view shows their distance in Scan Mode. It gives you a quick and informative summary of the entire course. What kinds of optics ULT-X use? This rangefinder uses ultra-clear, multi-layered optical lenses for exceptional visual clarity. You can magnify the view up to 6 times using diopter adjustments. Wosports Golf and GolfBuddy LR5 Rangefinder have a similar magnification range within the same price. Multi-coating lenses ensure glare-free visibility during a game. Bright sunlight will not effect on your par and your score sheet. What is the maximum distance ULT-X can measure? This rangefinder can measure up to 1000-yard distance with ultimate precision. Nikon Golf Coolshot 80i VR will provide the same measuring range and accuracy at the same price. But, other models of TecTecTec rangefinders provide a 500-yard measuring range at an affordable price. So these brands are a great combination of price and greatest distance capacity. How accurate is the ULT-X rangefinder? Accuracy is the best feature of this rangefinder. It gives unprecedented ±0.3-yard accuracy within 300-yards. This accuracy is better than other models of low-priced TecTecTec rangefinders. No other rangefinder models in the market have such accuracy at the same price. Does ULT-X have any pin locking mechanism? The device will vibrate each time you lock at a target. This pin locking feature provides confirmation and extra confidence. This is a great aid, especially for the novice golfers. Some pro-level golfers do not prefer any vibration while they are in the mode. In that case, Nikon Golf Coolshot 80i VR will be an ideal pick for them. A lock-on circle appears in the crosshair and confirms the bull's eye. What is Slope Mode in the ULT-X rangefinder? Slope Mode is one of the most useful features of this rangefinder. This mode adjusts and measures the distance when you have a hill to hit your next shot. No other models of TecTecTec and GolfBuddy LR5 rangefinders have this feature. But you can get this mode in Wosports Golf and Nikon Golf Coolshot 80i VR. TecTecTec ULT-X Golf Rangefinder is a "must have" device for any golfer for an affordable price. The rangefinder is packed with all the features required on a golf course. The price tag may make some wrinkles on your forehead. All these will be gone when you will make the most accurate shot on the hole in the field. Pinpoint accuracy, long range, and slope mode will make your every par smooth and shiny. High-quality optics and precision laser technology help to detect and aim the flag of your next hole. No matter what the weather is, you do not worry at all about this rainproof and moisture resistant device. ULT-X is a rangefinder packed with features in a reasonable price range. There is no way a golf enthusiast cannot be satisfied with it. Before your next Golfing session, go and get one!